This past weekend we had a real treat: we got to try Ghanaian food for the first time. And best of all, we had friends of ours from Ghana to help lead the way. 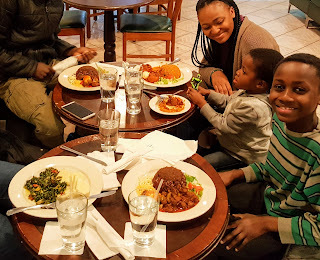 The restaurant was Appioo African Bar and Grill, and we all walked away quite satisfied. While vegetarianism isn't a common practice in Ghana (or so we were told), the restaurant has an excellent selection of veggie choices. 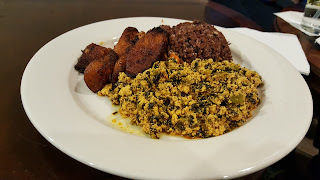 I tried a veggie version of Waakye, while Shira had Nkontombre (spinach stew). The kids also went for Waakye, though they included various meat selections. Shira's dish was reminiscent of Ethiopian cuisine, whereas the rice and beans of Waakye corresponded more to Mexican food. I was surprised to see that the food was served without bread (such a universal staple in so many countries) but our Ghanaian friends weren't surprised by this, apparently that's par for the course. My meal was tasty, but the fried plantains were by far the big winner. Though, who doesn't like fried bananas? We're truly lucky to live in an area where you're only a 15 minute drive from a brand new cuisine. Our server couldn't have been more nice or more helpful. Next time you're looking for something a little different head over to Appioo and enjoy!